If you're studying for the Certificate in Advanced English interview, welcome to our guide to the CAE Speaking test. Here's an overview of the oral paper (Paper 4) and advice to help you do your very best on the big day. Duration: 15 minutes (23 minutes for groups of three at centres where there's an odd number of candidates). Participants: Candidates interviewed in pairs or threes. Two examiners: one examiner asks the questions, the other acts as assessor and doesn't speak during the interview. Format: The test consists of four parts. 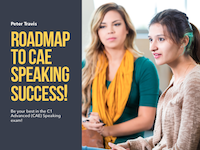 Roadmap to CAE Speaking Success!